This blog will be a collection of thoughts and ideas on ethical dilemmas and decision making in Physiotherapy practice as well as my values in relation to these decisions. I will also be writing about philosophy and perspectives, movement integrity, rehabilitation, and prevention. Why do I want to Become a Physiotherapist? I have recently discovered more sound education in regards to musculoskeletal problems. Of course, I am not a Physiotherapist but just a a student who wishes to be in the future. But since I have seen so many healthcare professionals for treatment, it has reinforced my understanding of the three R’s (Reset, Reinforce, and Reload) from the Functional Movement Systems concept. Personal experience is as we all know the greatest back-up in whatever we want to preach. Here goes my attempt from my perspective. The three R’s can be applied to two broad settings, rehabilitation and Fitness. Reset is pretty straight forward and it means we must restart our once innate neuromuscular motor control system or simply (movement) by using release/reset techniques to “free” up our body holistically or wherever the source of the problem arises. This could be done by seeing an RMT, Acupuncturist, PT, Chriopractor, etc. But I realized that the order is important for optimal recovery! For example, if somebody had chronic pain for 5-10 years or more, they should seek healthcare professionals in this order. First, see an RMT, Acupuncturist, Chiropractor, Dry needling specialist, or somebody who does deep tissue work or manipulation etc. Of course you can try resetting things yourself by using apparatuses such as a foam roller, tennis ball, golf ball, lacrosse ball, dowel, etc, but these methods will obviously not be as good as seeking a professional. Second, seeing a professional who can provide you advice on how to “support” your issue will be the next step. This is called reinforcement and can range from an orthotic insert to protective braces etc. This could be a Pedorthist, Podiatrist, Sports Medicine Specialist etc. Third is reloading. With all the work done in the first 2 steps, it is time to start moving/exercising with respectable load. The best professionals for this would be a movement expert or Physiotherapist who has knowledge in how mobility, stability, and motor control etc play part in holistic recovery. Resetting for fitness goals is a little bit different from rehabilitation because there is usually no debilitating pain. Often with some guidance on how to use good technique to release/mobilize your body (tissues) you will be able to get back into your routine. You could use a foam roller, dowel, or various sizes of balls as mentioned above, to do this. Of course, seeing a professional will speed up the process or get into areas that you do not know how. Reinforcing for fitness is in my opinion to move properly and functionally with good form. It does not have to be perfect but it has to be stable each and every time. Reloading is when you have addressed the first 2 steps and now feel more confident and less restricted you can attempt to challenge respectable loads once again. This way your fitness goals and gains will be more effective and efficient. A dynamic mobility stretch is often better than a stationary dynamic and static stretch. Rolling the bottom of your feet depends on your problem. In my now more informed opinion, rolling with a dowel or rod is more effective if you want to “re-balance” unstable feet. A ball is more for pinpoint “tightness/stiffness” but often the issue will have caused more problems in other areas due to compensation. The technique to rolling must be slow and controlled for reducing irritation to our tissues and allow our nervous system to relax thus relaxing our tissues. Functional Movement Screen: The 7 Movement Assessments. The Functional Movement Screen is a tool for dynamically assessing your body’s movement patterns and attempts to identify limitations and asymmetries that could predispose a person to injury. *If you have pain doing any of these tests then take care of that first. * (Images and a detailed link are listed at the end). 1) Active Straight Leg Raise (ASLR) – Lie supine on the floor and try to raise one leg as high as you can while keeping it straight, not moving your arms, head, lower back, or opposite leg which is almost in contact with the floor. 2) Deep-Squat – This test is more complicated and harder to do because it combines all the other tests together and see if they are working. Stand shoulder width apart, then squat down as deep as possible to an almost sitting position while keeping back straight. Also, do this while maintaining a stable dowel (long stick) over top of your head (straight arms). 3) In-Line Lunge – feet in line with each other in a comfortable lunge position and then perform a lunge while holding a rod/stick/dowel with opposite hands (one from come bottom and one coming from over the top) vertically behind you with it in contact with your neck, upper back, and lower back while keeping back straight, and feet/hips stable and rod/stick/dowel stable. 4) Hurdle-Step – Stand feet together with rod/stick/dowel in same position as the In-Line Lunge, then slowly step over the hurdle and touch other side with heel but do not put weight on it and bring your leg back over into standing. Alternate both sides while keeping back straight and rod/stick/dowel stable. 5) Core-Reflex Push-up – Get in a push-up position with your hands farther out and higher up and then attempt to do a push-up while keeping your hips, pelvis, and back straight. 6) Scapular-Stability – This test is also more complicated because it measures glenohumeral (shoulder) joint mobility, scapular stability, and thoracic spine mobility/rotation. Position your arms straight out at 20-30 degrees higher than the shoulders with hands in a fist (thumb tucked inside) and then in one motion reach both arms (one from under and other from over the back) and try to touch each other while maintaining both fists. 7) Rotary Stability – Get in a bird-dog position or on both knees and hands (four-point position) and straighten contra-lateral (opposite) arms and legs at the same time and try to maintain it for a couple seconds. Then while maintaining this position simultaneously bring elbow and knees towards the mid-line and touch before returning to starting position (Do about three times). Do both sides. 8) Seated Rotation (From a FMS youtube video) – Sit cross-legged, place a rod/stick/dowel across chest (touching collar bone/shoulders) with hands criss-crossed holding it in place. Then rotate/turn only your spine/trunk until the dowel reaches its destination (like the side of a door). Do this on boths sides while keeping back straight. Each test is scored by a 0-3 scale with 0 feeling the worst and 3 feeling the best. 0 = Pain while trying to perform test. 1 = Unable to perform test even with compensations. 2 = Able to perform and accomplish test with compensations. 3 = Can perform and complete the test without any compensations. http://www.advanced-fitness-concepts.com/fms.pdf – Here is a detailed link to the 7 movement tests. Note: ELIMINATE HARMFUL MOVEMENTS AND THEN ADD CORRECTED MOVEMENTS. Going to get straight to the point because that is all that matters. Most chronic pain patients have gone through A LOT so if the practitioner asks them to describe or rate their own pain there is sometimes a very vague response or simply an expression of just plain unsure! And this does not mean that they are “not” in pain or “are” in pain but it can also mean that they have had pain for so long that they/nervous system has become de-sensitized to their own body. Therefore, they have an extremely hard time trying to describe how much pain they feel at a particular moment, especially if the practitioner is bluntly rushing them! There is a reason why chronic pain patients search for help and it is not because they want to, it is because they “have” to. This may seem “obvious” to anyone but the lack of empathy and interpersonal connection in professional and personal settings show otherwise. It’s true that it is really hard for others who do not suffer from chronic pain to “understand” someone with chronic pain but this needs to change! This is where compassion and the “Open mind-set” comes in because this is required to understand even if it is only “slightly.” Too many people fail to show compassion and have that open mind until it is too late. What do I mean? What I’m trying to say is unless a “drastic or dramatic” situation occurs such as most “INSPIRATIONAL” videos which elicits “EPIPHANIC” realizations, many people choose not to or have little interest in showing compassion and turning on their mind! Of course this isn’t everybody but it is likely the majority. So I suggest, showing compassion and consideration and have that open mind-set before it gets extremely drastic or fatally dramatic. Painful memories are like flames that never die, but somehow a friend can put it out. There will always be people who have just gone through a terrible relationship and simply need someone to talk to. Whether you simply listen, give advice, or try to understand somebody’s pain, you will have done something admirable. This is of course very important in a friendship because your friends will be glad they have somebody close enough to share their problems with. That goes with the saying “having a few close friends is better than having many “faraway” friends =).” Everybody will have at least one painful or sad memory which resides within their minds and for some it may never disappear; but as long as we have support from a good friend or two then it will be much much easier. Are we trying to say that we are smarter than our innate nervous system (brain) that naturally gave us everything we had? To ice or not to ice? And I mean that in the most literal sense. I have recently acquired information about the biggest and most popular analgesic (pain reliever) controversy. Ice, the popular go to pain reliever may not be the best modality in treating our musculoskeletal injuries that we suffer throughout our lives. In “fact,” it absolutely goes against our body’s innate healing system. Now you may wonder why that is? Before you disapprove of this claim and fact and move on, I am going to explain what I have learned. What do you use “ice” for? Or to give you some control, what do you “want” to use ice for? In other words, what are some of the main reasons you want to use ice. Do you want to use it to relieve the Pain? Or do you want to use it to Heal? I believe that these two simple questions and the reasons behind them are extremely important to answer because the difference between them are physiologically enormous. To shortly breakdown one physiological aspect, the pain we feel is the response that our brain or nervous system sends to the injured area to tell us to avoid the use of that area in order to protect us from further harm. Therefore, it is absolutely necessary that we have this pain response. Now you should think about whether we should use “ice” to numb the area and block this signal? The obvious outcome from blocking the pain signal is that we may not know whether the area has suffered any further damage. There are three phases during healing: The first phase is the inflammation phase (which is the phase I will be focusing on), the second is the proliferation phase, and the final phase is the remodelling phase. 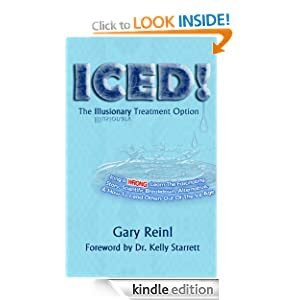 We all more or less use ice as a treatment modality in order to “slow down” inflammation in hopes of decreasing pain, and congestion or swelling in the injured area. Did you pick up on it? Good. Because the first phase of “healing” is the inflammation phase and it may also be the most important phase. This means we need the inflammation which is accompanied by redness, swelling, pain, and heat, in order to heal. But instead, we use ice to try to slow this process down. So now you may ask what do you do or which side do you pick? This depends on the two main questions and the reasons behind why you want to use ice. If you just want to relieve pain then you have no reason not to use ice. However, if you want to “heal” or increase the healing process, then ice may not be the best modality to use. If I haven’t lost you yet then it is time to get straight to the point. The pain is actually due to the “swelling and congestion” which is the pocket of fluid that accumulates in the injured area. This congested area is caused by fluids and our bodies healing systems which immediately sends macrophages and other cells to battle foreign matter and digest dead tissues in order to clean out the mess and set an ideal “platform” for the second and third phases of healing. This is what I call “positive congestion.” Of course, when there’s a positive there has to be a negative and that is the digested dead tissue and other foreign matter which tends to pool in the injured area “if” we do not clear it. Now can you guess what ice does? Yes, by icing and also “resting” too much, the congestion and swelling will stay in the area which may cause more damage. In other words, ice attempts to slow down inflammation by freezing the surround nerves and tissues; but luckily it does not. Because if it did, then we would not heal. We may be smart but we can never trump our brains in a battle of innate intelligence. So how do you get rid of this congestion? There are 3 main ways and it does not include ice. The three simple ways are “movement, massage, and isometric contractions (contracting muscles with out changing in length at the joints).” Treatment modalities such as Intramuscular stimulation and transcutaneous nerve stimulation may assist in these contractions. Now this is where the “lymphatic system” plays the biggest role. Since this system only goes one way (up), it is the main pump and pathway for “waste and garbage” to leave the damaged area; and this is the only way to decrease the congestion and in turn lead to a decrease in pain. If the waste is not pumped out then the brain will think there is still foreign matter in the area and will fight and in turn cause more inflammation. Movement, massage, and isometric contractions effectively and efficiently get rid of this waste. Think of all three like mechanisms that squeeze on the lymphatic vessels to pump the waste through its “one way” pathway. However, all that I have said is not set in stone or absolute because everything in life requires a balance and people possess different behaviours. In other words, I understand that some people may need the ice to relieve the pain and then slowly work on the 3 ways to eliminate the congestion. That is fine as well. As long as we know the reasons behind using cold therapy. We are all human beings and our similarities make our lives, but our differences balance it. Thanks for reading. I just wanted to spread this information because it makes sense to me nad there are evidence to support it. Now we are left with a choice instead of an automatic response (ice) to treating an injury. P.S. : Ibuprofen (Advil, Motrin) “may” also be controversial as it may not only slow down but also “prevent” the inflammation phase during healing. Credits to: Gary Reinl (Author of “ICED: The Illusionary Treatment Option) and Kelly Starrett (MobilityWOD).